Based based on a play written by Michel Marc Bouchard, Tom is a young advertising copywriter who travels to the country for the funeral of his friend, partner, lover. There he meets the woman who would have been his mother-in-law, Agathe, and her son, Francis – neither of whom know Tom even exists. Blindsided by his lost partner’s legacy of untruth and with the mother expecting a chainsmoking girlfriend and the older brother hellbent on preserving a facade of normalcy, Tom is coerced into joining the duplicity until, at last, he confronts the torment that drove his lover to live in the shadows of deceit. There, he`s shocked to find out no one knows who he is, nor who he was to the deceased. 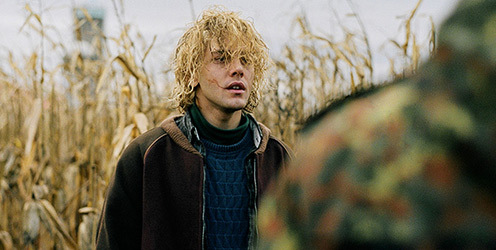 In order to protect the family`s name and grieving mother, Tom now has to play the peacekeeper in a household whose obscure past bodes even greater darkness for his “trip” to the farm. 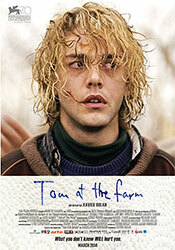 Selected to screen at the 70th Venice International Film Festival and at the 2013 Toronto International Film Festival.